Gorgeous Estate w/ Guest House. Near Ski Resorts w/Hot Tub, 3 Game Rooms & MORE! 5 Bed/5 Baths, Sleeps 20 - Hours of Entertainment Located Inside & Out! Bellagio is a one-of-a-kind home that has a TON to offer! Located south of Salt Lake City at the base of Big and Little Cottonwood Canyon you’re minutes from Solitude, Brighton, Alta and Snowbird resorts. Sleeping up to 20 people, 5 bedrooms and 5 bathrooms are spread between 5000 sq. ft. of the main house and a separate guest house. Arriving to beautifully manicured grounds, the long driveway provides ample parking and a standard basketball hoop (balls provided). Step inside and take in the 30 ft. ceilings with large window views that bring the seasons to life, defining the very character of the open living room where two gas fireplaces warm the atmosphere. The main house includes 4 bedrooms / 3.5 bathrooms, a large gourmet kitchen featuring a gas range island, bar seating, ample counter space and two dining room tables that seat 16 (as well as an adjacent patio with table seating for 8). Upstairs features a unique kid friendly nook complete with a twin mattress, toys, books, stuffed animals and games. 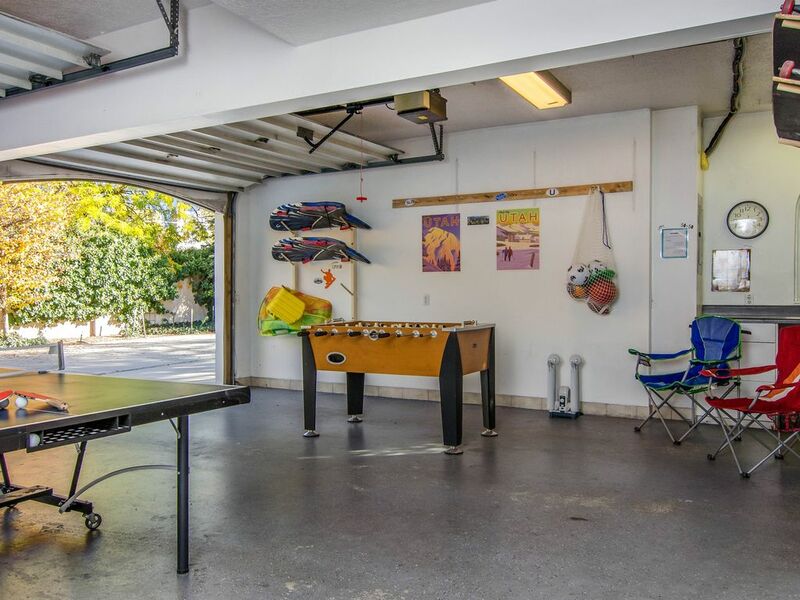 The main house garage has a folding Ping Pong table (paddles/balls included), a Foosball table and outdoor chairs. Ski storage is available to hang ski and/or snowboard gear, complete with boot warmers and long counters to wax and tune equipment. Adjacent is the Carriage house. With a private entrance, master king suite, full bathroom, HD TV, kitchenette and private balcony, this can be a quiet retreat from a large group. Below the living space is a SPECTACULAR one-of-a-kind game room. The Carriage house game room features an LED 4K Ultra HD TV for gaming, movies and karaoke, YES, KARAOKE! The karaoke machine includes two microphones with easy blue tooth connectivity and a DJ disco laser light ready to set the mood. Singing not your thing? Play a round (or five) on the fun Double Shot arcade basketball game, try your luck at the Air Hockey Table and unleash your inner child with unlimited plays! Let’s not forget the dart board fit for tournaments. With a sectional sofa and a partial kitchen with fridge, microwave and sink, you have everything you need. Newly added board games (like giant Jenga blocks) will keep your family & friends going for hours. Could this house get any cooler?! It Does! The park like yard has multiple sitting areas, a stream, hammock, disc golf and luxury fire pit. The secluded hot tub is perfect after a long day of work, skiing or just having fun. * Ultimate gamer's paradise with endless indoor/outdoor games, equipment, & activities for all ages! * Ski/snowboard tuning countertop to wax, repair, & tune all your gear! This home is known locally for it's unique look, beauty and great ski and mountain proximity. We have been fortunate to have many different groups stay with us and skiers especially love this home. The home is perfectly set up for vacationers because of it's quality, beds and baths, included studio guest house that is detached and great parking. Having undergone a makeover, this estate now features 1000's of gaming options, areas to rest & relax in the park like backyard and added features that will make this home your absolute favorite place to return to. This home is packed with so much entertainment, you'll never be ready to leave. With 3 game rooms spread between the main house and guest unit, there are endless ways to make memories. 24/7 staff and guest services available, discounts on rental cars, ski passes, ski rentals, and airport transfer service available. Linens, towels, and complimentary toiletries provided. Large driveway can accommodate 4-5 cars. Standard spice rack provided. Grocery delivery available-call for details. Beautiful kitchen with lots of counter space, island with gas range. Guesthouse kitchenette with mini fridge, microwave. Breakfast nook dining table seats 6. Kitchen bar seats 3 Formal dining table seats 6 (10 with leaf in). Netflix, YouTube, Hulu, Amazon Prime apps easily accessible on smart TVs. Flatscreen TV in each bedroom, HD TVs in Game Rooms. Variety of adult literature and children's storybooks throughout multiple rooms in the home(s). Arcade quality Air Hockey Table, Double Shot. Karaoke machine w/ 2 mics, Dart board, Board Games, 55" 4K Ultra HD TV, Disco Ball w/ laser lights, Kitchenette, Giant Jenga, Casino & MORE! Star Wars Monopoly, Battleship, Balderdash, Trivial Pursuit, Chess, Tic-tac-toe, Backgammon, Rook, UNO, Dominos, Candyland, Operation, Memory, Apples to Apples ... Too many to list! Elsa's Ice Castle dollhouse, Elsa, Anna, Sven, and Olaf dolls, Fisher Price dollhouse, Variety of Plush Animals: Teddy bears, Mickey, Goofy, Donald Duck, Pluto. Catalog of 100's of DVDs to choose from. Collection of popular and Disney DVD and VHS classic movies. Gorgeous yard w/ large mature shade trees and a meandering stream in backyard. Enjoy Frisbee Golf, Hammock, Trampoline, Firepit, Grill, Hot Tub, Bowling and More! (2) one private balcony in jr. master and one in guest house room. Available from our partner (ask for details). Ski storage for 10 sets, Snowboard storage for 4 boards, Tuning area to wax, repair, and tune all your gear. Boot, Glove & Helmet dryers provided too! Snow sleds, Snow castle playset for children. Public tennis courts available at nearby public parks within 2 miles. Huge mature trees providing year round shade & complete privacy, immaculate mature landscaping on .3 acre, balcony, an amazing detached, private studio guesthouse with 2nd master suite, including kitchenette, full bath, vaulted ceilings, separate heat and A/C. This home also comes with a full 2-car over-sized garage & parking. Formal dining table for 8 in as well as a breakfast nook with informal dining that seats an additional 6, plus seating for 3 at kitchen bar. Wet bar upstairs with fridge and sink, a library collection with hundreds of books..
Nice home, great central location, great communication w rental co, plenty of beds and sleeping accomodations for a big fam, nice roomy kitchen to cook comes fully stocked with everything needed, nice yard- do note there is a creek/small river going through the backyard so if there are little ones you will need to keep a good eye on them as there is no fence, check your spam for door code email (normal emails came through but that one went to spam), the kids were sad the wii game reader in the game room wouldn't work most of the time (it has a spotty disk reader, they finally game up on it) also note that neither of the jetted tubs jets worked in either master suites (it's not said they have jetted tubs but when you see them and are excited to use them when you get your tub filled and they don't work it's kind of deceiving and a let down so a courtesy note next to tub would be nice), also there were tons of Disney movies to watch via VHS in the rooms although none of the VHS players worked, after we bought and replaced most batteries in the remotes to the TVs they worked though. Overall great stay, we didn't spend too much time inside the home during our week stay but it was comfortable and safe and we all slept well! Thank you, would stay again. Perfect place for a wonderful ski trip. We comfortably stayed at the Bellagio with 12 adults. The kitchen was wonderful, plenty of room for lots of cooking. The pantry was also stocked with TONS of things, it was excellent. The only thing we couldn’t find was Tupperware for leftovers, but no big deal. The house had plenty of living space for the large group to spread out. We enjoyed the hot tub daily and a few of the games. The location was a quick drive to the ski resorts and grocery stores. I would definitely stay here again! Fantastic property! Had 11 people staying in our group and had plenty of room! A large group of us (12 people) stayed for a long ski weekend and found this home to be comfortable, spacious and with the all amenities necessary. It's also conveniently located near the main road up to Alta and Snowbird so less than a 30 minutes drive up to the slopes. The house could benefit from some routine maintenance but overall we enjoyed our stay and found this to be a great fit for us. Exclusive location in the 'Beverly Hills' area of Salt Lake City. Only 4 miles to Big Cottonwood Canyon (ski resorts). Minutes to nearby shops, restaurants, and exciting attractions! Salt Lake is very unique because you can go boating, fishing, hiking, golfing, have a barbecue and hit a movie all in the same day. The activities that Salt Lake has to offer are endless. This home is only within 15 to 30 minutes away from anything and everything that Salt Lake and Park City have to offer.